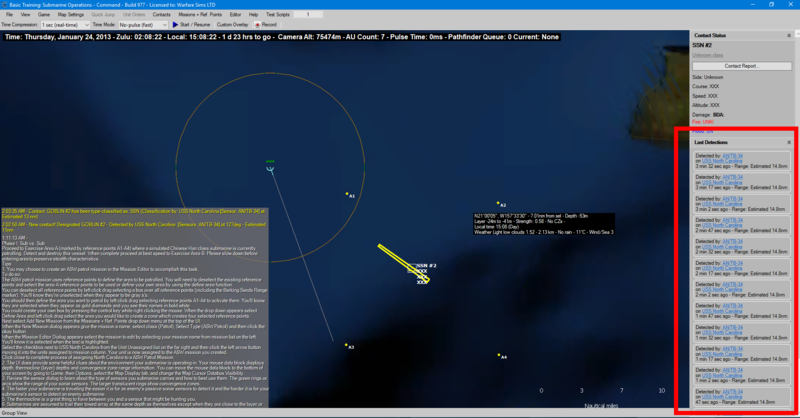 Command: Modern Air Naval Operations has been updated to version 1.14! This new version brings tons of improvements and changes, including some major enhancements to the UI, to the mission editing and addition to the database! Waste no time! Check out the full changelog below. • Substantial performance boost on both user interface and simulation-core execution. • Configuration files (*.ini) are now automatically consolidated at the [CMANO]\Config folder for easier management. Clicking on the sensor name brings up the DB viewer page of the carrier platform and highlights the sensor stats. Clicking on the detector platform name selects the platform and centers the map on it. This can be quite useful in situations where it is not clear which of multiple units actually detected a contact (e.g. a surface group tracking a target) or in cases where it is desirable to understand which of multiple different sensors can actually hold the contact (quite common e.g. in submarine & ASW operations). • New feature: "Mark contact position" function on contact context-menu (right click on contact, select “mark contact position”). This can be useful when tracking contacts with uncertainty areas for a protracted duration (e.g. ESM, passive sonar etc.) and want to retain an on-map track of their estimated locations over time. • New feature: Speed/Altitude window addition: “Do Not Cavitate” (Valid for ships & submarines only). When this is enabled, the crew AI automatically stops short of stepping into the cavitation speed for the given depth. The preference is ignored when the platform is evading a weapon (captains in this condition usually do not give a high priority to avoiding cavitation...). • Users can now define circle-area in addition to existing rectangle-area (right click on empty map location). • UI addition: When displaying a weapon on DB Viewer, show platforms that carry it by default. Also, clicking on any of the platform names navigates to this platform. • "Special Actions" window tweak: Show the SA description when hovering over an SA. • Added: Ability to set Sprint-Drift and “Avoid Cavitation” behavior as waypoint order. • New feature: All torpedoes with terminal guidance, plus a few modern missiles, are now able of re-attacking if they are successfully jammed/decoyed just prior to impact, or if they fail their hit-or-miss check. In the latter case, the weapon must also pass a reliability check, with the chance of a dud being ¼ of the original PoH. If the weapon is eligible for re-attack, it passes right over/under the target and begins a spiral search until it is able to re-acquire a target (or runs out of fuel). • New feature: Torpedo wire breakage. Submarines, in addition to their "standard" turn rate, now also have a "crash" turn rate (+25% of nominal) which is used only for weapon evasion. If a sub is controlling wire-guided torpedoes while it makes a crash turn or while its speed is over 10 knots, the guidance wires may break, with the weapons going autonomous. • New feature: Cargo pickup. Currently works only with aircraft (helos and VTOLs), and is manual-ordered only (no mission-driven behaviors as yet). To perform it, right-click on a suitable aircraft and select "Select unit(s) for pickup". The cursor will change to a targeting crosshair and you can select one or more target units from which to pick up cargo-type mounts, if they have (for example, to order a helicopter to pick troops from a mobile ground unit). Once it has picked up cargo, the aircraft can be ordered to RTB, and upon landing it will unload the cargo to its host unit. • New feature: "Flaming datum" (probable sub contact) special detection mode. When a ship gets hit by a torpedo that has been completely undetected (not uncommon even today, if the ship does not have sonar or AIR systems), a "probable sub" contact is generated at the point of impact. Nearby ASW-tasked assets can then commence their search for the presumed submarine to try to fix and prosecute her. • New ScenEdit feature: "Chance of appearance" (Right click on unit in ScenEdit --> Scenario Editor --> Chance of appearance). This allows setting easily the chance of a unit actually showing up on the next scenario load (at normal-play mode). Units that fail the appearance check are discarded permanently. Applies to platforms only (not weapons). • When exporting facilities using .inst files, boats berthed in these facilities are retained. This is makes it easy to preserve nominal fleet ORBATs for specific historical periods (e.g. which ships were berthed in Norfolk on June 15, 2006). • UI tweak on "Scenario time and duration" window: Added "Copy from current date & time" button for the scenario-start values (So once you have the proper current date & time set up, you can quickly copy them to the "scenario start" fields). This helps the AI to deal more intelligently with probes, feints, decoy attacks etc., and avoid over-allocating assets on a few targets at the expense of others. • [Lua] You can set a unit's sprint-and-drift status through Lua. • Includes rebuilt & updated versions of all official standalone & DLC scenarios. • Bart Gauvin's "Strike Tutorial" scenarios are now included in the tutorials, and can be played either individually or as a campaign (Start Menu --> Campaign). Building (Very Large Leadership Compound) -- Generic (Generic), Church, Mosque, Temple, Synagogue, Gurdwara, etc. Building (Place of Worship) -- Generic (Generic), Church, Mosque, Temple, Synagogue, Gurdwara, etc. Been wanting it for years and now it's here! Thanks, guys! Status: offline Yes, that is a cool one. I actually play around with it a lot. Status: offline *LOVE* the mark contact feature. I've been doing that manually forever. Very convenient. Status: offline is there any difference in this than the 1.14 998.2 beta version that i have installed...? is there any difference in this than the 1.14 998.2 beta version that i have installed...? [bug?] When Database viewer is open, a rightclick on a unit does not open the "Unit orders" popupmenu anymore. A black vertical line appears (in the map window) and the Database Viewer flickers/reloads - and sometimes temporarily freezes the game. Can anyone confirm this, or just my rig? But could you be a littlebit more specific? Which nukes? Located where? Developer "Command: Modern Air/Naval Operations" project! Strike last comment, found and fixed for next version. Thanks for pointing this out! Yes some minor fixes here-and-there. Please post bug reports in the Tech subforum. Thanks! New feature: Cargo pickup. Currently works only with aircraft (helos and VTOLs), and is manual-ordered only (no mission-driven behaviors as yet). To perform it, right-click on a suitable aircraft and select "Select unit(s) for pickup". The cursor will change to a targeting crosshair and you can select one or more target units from which to pick up cargo-type mounts, if they have (for example, to order a helicopter to pick troops from a mobile ground unit). Once it has picked up cargo, the aircraft can be ordered to RTB, and upon landing it will unload the cargo to its host unit. Added: Ability to set Sprint-Drift and “Avoid Cavitation” behavior as waypoint order. Status: offline Thanks for the update! I've also updated my Steam Guide to account for the new tutorials being present. Status: offline This is beautiful! Thanks! Status: offline Thanks for updating.